Bryn Celli Ddu /brʌn keɪli ði/ is a prehistoric site on the Welsh island of Anglesey located near Llanddaniel Fab. Its name means 'the mound in the dark grove'. It was archaeologically excavated between 1928 and 1929. Visitors can get inside the mound through a stone passage to the burial chamber, and it is the centrepiece of a major Neolithic Scheduled Monument in the care of Cadw. The presence of a mysterious pillar within the burial chamber, the reproduction of the 'Pattern Stone', carved with sinuous serpentine designs, and the fact that the site was once a henge with a stone circle, and may have been used to plot the date of the summer solstice have all attracted much interest. Bryn Celli Ddu is generally considered to be one of the finest passage tombs in Wales. Unlike many stone chambered tombs, this not only has a complete passage and burial chamber, but is also buried under a mound or cairn, although this was re-instated following its excavation in 1929. As it now stands, the passage is 8.4 m (28 ft) long, the first 3.4 m (11 ft) being unroofed with a pair of portal stones. The main passage runs between vertical slab rocked walls roofed by a series of stone lintels. The mound, being substantially smaller than as originally made, no longer completely encloses the burial chamber, so the back wall is open to the air, allowing some natural light in. Free-standing inside the burial chamber is a smooth pillar of blueschist, a metamorphic rock, some 2 m (6.6 ft) high, with a very rounded shape. Beyond the back wall of the chamber, in a location that would once have been within the mound, is a replica of the 'Pattern Stone'. This was found buried under the mound, and has been put standing up in what is thought to have been its original location at a time when the site was a henge rather than a tomb. The patterns take the form of sinuous serpentine shapes that wind around both sides of the stone. Inside the tomb another stone has a small spiral pattern chipped into it, although its authenticity has been questioned. Outside the tomb, a ring of kerbstones shows the original extent of the mound, and they also follow the line of the ditch of the earlier henge monument. Three of the stones, visible within the cairn mound, are thought to be from the stone circle of that time. The passage is roughly aligned with the Summer Solstice sunrise, such that for some weeks around the summer solstice, sunlight can find its way through to the back wall of the burial chamber. The monument is part of a cluster of Neolithic and Bronze Age features. Two further cairns have been identified just to the south of Bryn Celli Ddu, while in the field immediately to the west is a standing stone, and a rock outcrop with cupmarks carved into it. The earliest identified remains at the site are a row of five postholes previously thought to have been contemporary with the tomb. Radiocarbon dating of pine charcoal from two of the pits, carried out in 2006, showed these to date from around 4000 BC, putting them at the end of the Mesolithic, 1,000 years before the next phase of use. Their purpose, however, is unknown. In around 3000 BC a henge monument was constructed. An outer circular bank and ditch would have defined the boundary, although only the ditch survives, some 21 m (69 ft) across. Within this, a stone circle would have provided the focus for a site of ritual significance. A ring of 17 stones formed an oval, many being in matched pairs either side of the centre. Cremated human remains were buried at the base of some of them, suggesting a central 'altar' During this period a pit was dug within the henge; a single human ear-bone was buried, and covered with a flat slab. A second stone known as 'The Pattern Stone' lay nearby, with the serpentine patterning on it. It is thought this would have stood upright within the henge, as the patterns cover both sides. Some 1000 years after the henge was built, the site was radically altered. All but one of the standing stones were intentionally damaged, some were knocked over and six were smashed with heavy stones. In its place a passage grave was built. Much larger than the mound now remaining, it would have had a complete circle of kerbstones following the line of the old henge ditch, creating an impressive retaining wall around the mound, 26 m (85 ft) across. The burial chamber would have been entirely enclosed within the mound, rather than the back wall being open to the air, as in the reconstructed mound now seen. Individual human bones, both burnt and unburnt, were found within the chamber and passage, suggesting a variety of funeral practices, but in all cases re-using the tomb, and clearing aside the old remains. At the end of its period of use the tomb was 'closed' by means of a large stone set across the entrance, between the two portal stones. The earliest archaeological descriptions date to around 1800. In 1796 it was included on a list of Anglesey cromlechs in the Cambrian Register. In 1802 Rev John Skinner made a "Ten Days' Tour Through the Isle of Anglesea", an account of which he wrote up, but never published, describing the numerous archaeological sites he visited. It was finally published as a supplement to Archaeologia Cambrensis in 1908. On his visit to Bryn Celli Ddu, he was told how the passage tomb had been discovered a generation before, by a farmer looking for useful stone. The sight of the pillar stone had initially unnerved the discoverer, but the prospect of treasure tempted him back, and he uprooted the pillar. Having suffered depredation of the more movable stones of the site, the monument was excavated by W J Hemp in 1928-29. He revealed much of the sequence of use on the site, and found the 'Pattern Stone'. It has since been moved to the National Museum of Wales and replaced with a replica standing outside the back wall, but within the area of the original mound, and close to the spot where it was found. The Pillar was set back upright, and the earth and stone mound covering the passage and chamber was reinstated, but clearly there was much less material available than had been used originally. Some additional concrete roof supports have also been added at some point. Norman Lockyer, who in 1906 published the first systematic study of megalithic astronomy, had argued that Bryn Celli Ddu marked the summer solstice. This was ridiculed at the time, but research by Christopher Knight and Robert Lomas in 1997- 98 showed it to be true. Knight and Lomas also claimed that year-round alignments allowed the site to be used as an agricultural calendar. Steve Burrow, curator of Neolithic archaeology at Amgueddfa Cymru (National Museum of Wales), has more recently supported the case for summer solstice alignment. This alignment links Bryn Celli Ddu to a handful of other sites, including Maes Howe, Orkney and Newgrange, Ireland, both of which point to the winter solstice. It has also been suggested that a feature similar to the 'lightbox' at Newgrange may be matched at Bryn Celli Ddu. The serpentine pattern and the passage tomb featured strongly in the short animated film, 'Songs from Stones', about some of Anglesey's evocative archaeological sites and artifacts, produced as part of the Cultural Olympiad in 2012. South-west side. A replica of the decorated stone stands outside the south-west opening in the burial chamber. Wikimedia Commons has media related to Bryn Celli Ddu. ^ "Bryn Celli Ddu Revisited - Rupert Soskin Photography Blog/News". rupertsoskin.com. ^ a b c Yates, M.J.; Longley, David (2001). 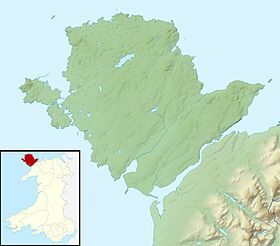 Anglesey: A Guide to Ancient Monuments on the Isle of Anglesey. Third edition. Cardiff: Cadw. ISBN 978-1-85760-142-8. ^ a b c Pitts, Mike (2006). "Sensational new discoveries at Bryn Celli Ddu". British Archaeology. 89 (July/August). Archived from the original on 23 September 2015. Retrieved 9 June 2014. ^ "The burial tombs of Stone Age Wales". National Museum of Wales. 14 May 2007. Archived from the original on 14 July 2014. Retrieved 10 June 2014. .
^ Skinner, Rev John, Ten Days' Tour Through the Isle of Anglesea, December 1802. Archaeologia Cambrensis Supplement, 1908, Reprinted by Coastline Publications, 2007. ^ W. J. Hemp (1930). VII.—The Chambered Cairn of Bryn Celli Ddu. Archaeologia (Second Series), 80, pp 179-214. Steve Burrow... says the mound's stone passage points at the midsummer rising sun... The rays light up a quartz-rich stone at the back of the tomb.